AS IN THE LONG AGO: What's the big hurry? When I started teaching back in 1986 the world of the English primary school was on the point of huge changes. I had qualified as a teacher in 1977 as a member of one of the first groups to be able to take a Postgraduate Certificate in Education for primary teaching. This had previously been reserved for secondary teachers and was introduced as part of a drive to get more graduates into primary schools and raise the status of the profession and the quality of teaching. I trained with an interesting and talented bunch, and the course had its interesting aspects, too. We discussed child development and theories of education. We read Rousseau's 'Emile For Today' and John Holt's 'Why Children Fail' and Ivan Illich's 'Deschooling Society'. We read Piaget and his disciples and critics. We even learned to teach. But by the time I qualified there were almost no jobs, as we were informed by someone who came to the college to tell us about getting a job. So I started making jewellery instead, as people did back in the mythical seventies. Ten years later I was drawn back to teaching and when I started applying for jobs my friend, Mike Ingham, recommended that I read the Plowden Report. He said it with a twinkle in his eye, and then said, echoing the ancient Chinese curse, that it was 'an interesting time' to be entering primary education. He couldn't have been more right. By 1988 we had the Education Reform Act which introduced the National Curriculum. The politicians said they'd tell us what to teach, but not how to teach it. We had to wait for New Labour to tell us how to teach - fifteen minutes of word level work, fifteen minutes of sentence level, twenty minutes of activities and then a plenary session - that was the Literacy Hour. 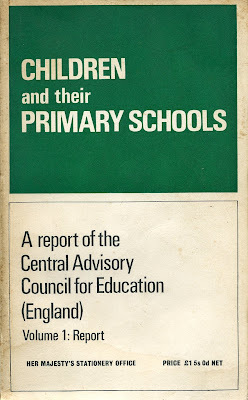 And the result of that was that children did less reading and writing and talking than they had done before, and instead of getting to know their children teachers spent hours puzzling over phonemes and graphemes and connectives and feeling stupid for not understanding. There was so little time left for writing that six-year-olds were planning a story on Monday, writing the opening paragraph on Tuesday, the middle on Wednesday and the ending on Thursday, by which time both they and their teachers had totally lost interest. The introduction of guided reading where groups of children read the same book at the same time led to the arrival a great many second- and third-rate texts produced in an enormous hurry to fit with the Literacy Strategy. These books came complete with teachers' books which gave (and still give) a step-by-step guide to talking to the children about the text in question. I won't quote them. They are astoundingly banal. "(Susan Isaacs) (in The Children We Teach 1932) identifies the three kinds of spontaneous activity that characterise the lives of young children. experts in curriculum design; they spontaneously and holistically do ‘coverage’ of their own accord – no sticks or carrots needed."